As graphic designers, we are huge fans of well designed and well researched infographics, so naturally we were pretty excited to see some Thanksgiving-themed infographics coming our way from leading data visualization website Visual.ly just in time for our holiday weekend. “If turkey is the star of Thanksgiving dinner, then pie is most certainly the encore. America’s love affair with this golden-crusted treat has been well-documented in pop culture; in fact, a 2012 survey by NPR examined pie preferences and determined that, indeed, there is nothing more American than apple pie. 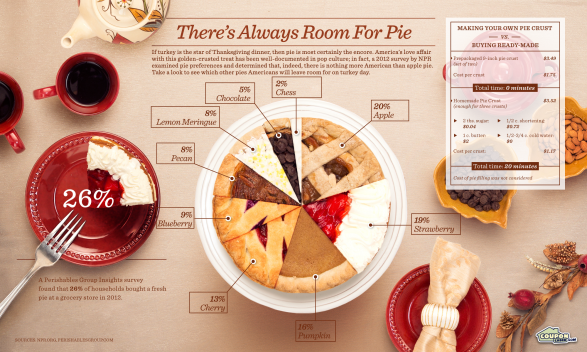 Take a look to see which other pies Americans will leave room for on turkey day,” states Visual.ly.